The recent history of Chile. In September 1970, Salvador Allende, the Marxist candidate of Unidad Popular (a coalition of five left-wing parties) was elected to be President of Chile. He promised to transform Chilean society by constitutional means. The Government fails to obtain a congressional majority in the elections of 1973 and encountered a deteriorating economic situation as well as intensification of violent opposition to its policies. The repeat clashes between pro and anti Government activities started. The Armed Forces finally intervened in September 11 on 1973. They bombarded the Government's House, where inside was the President. Salvador Allende died during the coup. Augusto Pinochet, who was in charged of the Army, took the power of Chile and decided to dissolved The Congress. 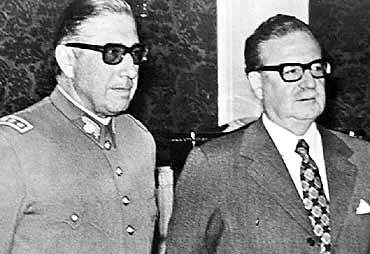 The Military Junta (Junta Militar) dedicated itself to the eradication of Marxism and the reconstruction of Chile and its leader, General Augusto Pinochet, became Supreme Chief of State in June 1974 and President in December of the same year. The Junta was widely criticised abroad for its repressive policies and violations of Human Rights. Critics of the Regimen were tortured and imprisoned, and several thousand were abducted or "disappeared" (more that 1 million of people). Some of those who had been imprisoned were released as a result of international pressure, and sent into exile. Public protest continued throughout 1984 and 1985. A number of protesters were killed in violent clashes with security forces during this period, and many appositions leaders and trade unionist were detained and send into internal exile. In 1988 several political parties and opposition groups have established the "Comando por el No" ( a group anti-Pinochet) to co-ordinate the campaign for the anti Government vote at the forthcoming elections. The opposition made repeated demands for changes to the Constitution, in order to accelerate the democratic process, and sought to initiate discussions with the Arms Forces. However, Pinochet rejected the opposition's proposals, and affirmed his intention to remain in office until March 1990. In 1989, the Presidential and Congressional elections took places. Patricio Aylwin (the head of the left-wing parties) became President of Chile. Meanwhile, Pinochet became the focus for widespread disaffection with the military élite, but resisted demands for his resignation, reiterating his intentions to continue as Commander-in-Chief of the Army until 1997. . In October 16, on 1998 Augusto Pinochet was arrested at a privet clinic in London, where he was receiving medical treatment for a back injury. Now he is been sued of Chile's population because he deserves to pay for all the pain that he made.